For the final week of Blogging Marthon#41,I chose to cook with pick one ingredient and cook for 3 days,the ingredient is green peas. 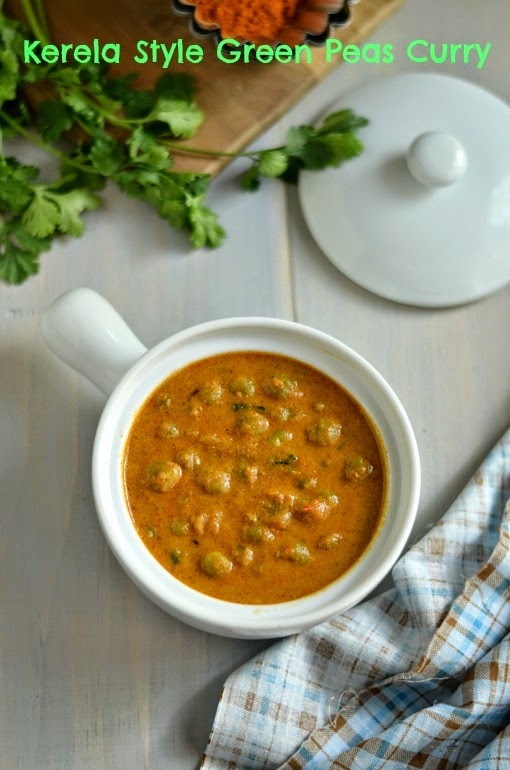 I will be showcasing the recipes with green peas for next few days.Today's recipe is a flavorful green peas curry with coconut milk.Here I used the soaked dried peas and it can be made with fresh green peas. Pressure cook the green peas with a cup of water and a pinch of salt for a whistle in a medium flame. Heat a tbs of oil in a pan and saute the onion,ginger and garlic till transparent,add the chopped tomatoes.Cook it till mushy,put off the flame and grind it to a fine paste after cool down completely. Heat a pan with the remaining oil,crackle the cumin seeds and add the ginger&garlic paste for a minute.Then add in the finely ground paste and cook it till the oil separates.Add in chilly powder,coriander powder,turmeric powder and salt.Add 1/2 cup of water and cook it in a medium flame till the raw smell disappears.Add the cooked peas now and adjust the consistency with water if needed.Let it boil for another couple of minutes. Sprinkle the garam masala powder and add the coconut milk,let it boil for another 3-4 minutes.Finally sprinkle the coriander leaves and put off the flame. If fresh green peas is used then cook it in an open pot with a pinch of salt,separately and add it. If you want more of garam masala flavor,the add 2 cloves and 1/2 piece of cinnamon along with cumin seeds for tempering. Check out my fellow bloggers participating in Blogging Marathon #41. Fantastic clicks. .trust me I just kept scrolling over and over again to enjoy the clicks..loved the black and white with a tint. The curry sounds delicious too. Looks very rich and creamy. I bet the coconut milk added the 'extra' taste!! Great side-dish for rotis. Superb clicks. 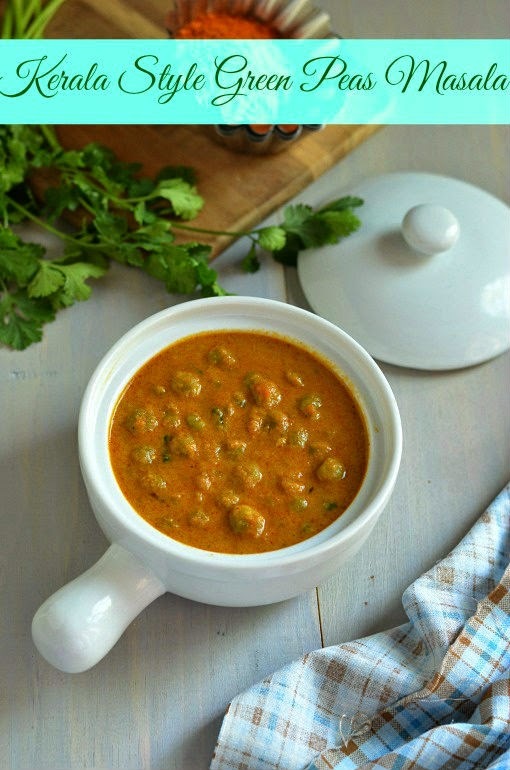 Yummy recipe.. Tastes great with roti or paratha. 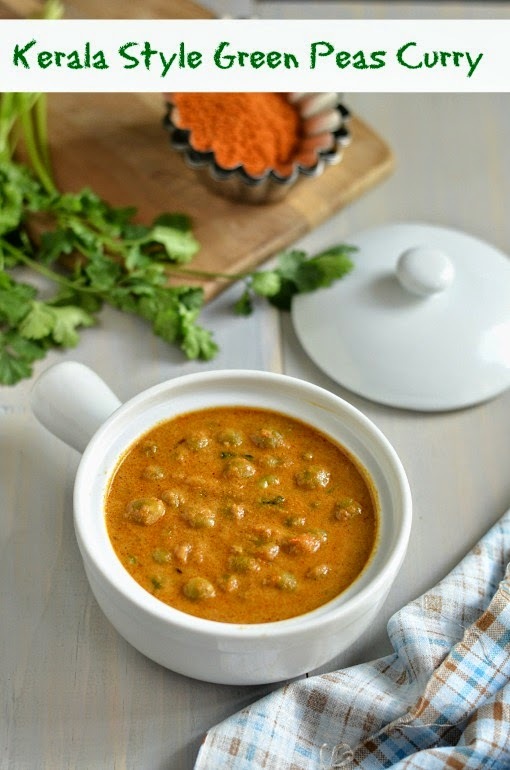 I never knew there was a specific peas curry from kerala..the recipe and pictures look awesome..will have to make it sometime.. 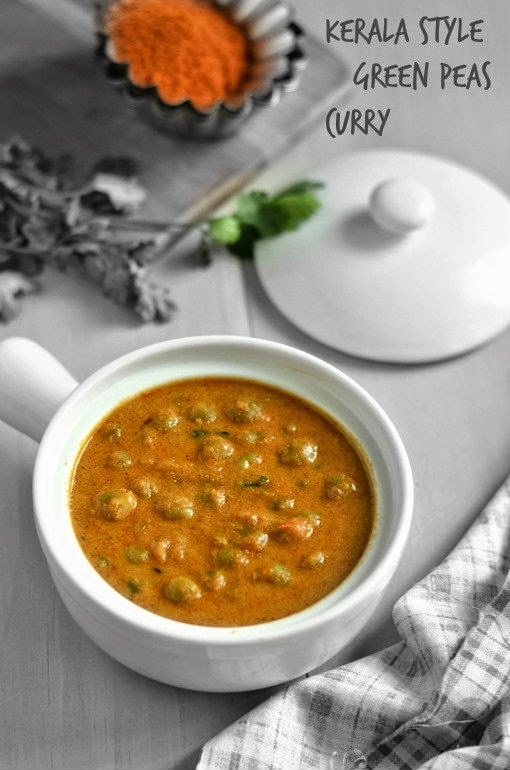 Such a delightful and very rich looking fingerlicking green peas curry, a prefect side for parottas. Love to have this curry with idiyappam, looks delicious..
looks yummy n delicious,love it!!! Curry looks rich and creamy! And lovely pictures. Green peas in coconut milk gravy sounds delicious.